Read the full transcription on the Heinz Marketing Blog on 11/05/18 starting at 6am PST. 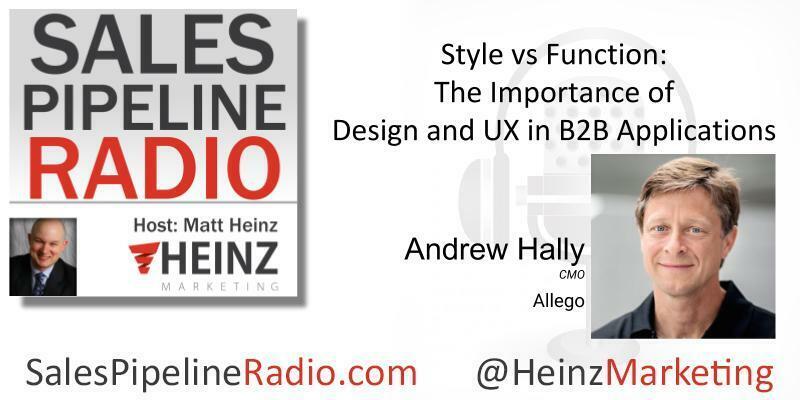 This episode: Style vs Function: The Importance of Design and UX in B2B Applications. What a great conversation with Andrew Halley, CMO of Allego! When you think about the conversation you have with your customer, you know what's produced from marketing is just a fraction of what actually gets communicated and so creating integration across the company to improve consistency and value of that conversation is one thing. Getting feedback from the field, feedback from those people that are in front of the customers more often.. is another. Marketing isn't talking to the customer nearly enough by default as sales and account management is. I think you can tell first hand which companies tend to prioritize function, which of them tend to prioritize the usability, and which of them are just flinging out features. We talk about Andrew's perspective on this and how one can balance style and function in a B2B application.... and a lot more, listen in! A big thanks to our sponsor, MailTag.io.